Nerves are primarily classified based on their direction of travel to or from the CNS, but they are also subclassified by other nerve characteristics. Nerves can be categorized as afferent, efferent, and mixed based on the direction of signal transmission within the nervous system. Nerves can be further categorized as spinal nerves or cranial nerves based on where they connect to the central nervous system. Individual peripheral nerve fibers are classified based on the diameter, signal conduction velocity, and myelination state of the axons, as well as by the type of information transmitted and the organs they innervate. mixed nerve: Nerves that contain both afferent and efferent axons, and thus conduct both incoming sensory information and outgoing muscle commands in the same bundle. Schwann cell: The principal glia of the peripheral nervous system. spinal nerve: The term generally refers to a mixed nerve that carries motor, sensory, and autonomic signals between the spinal cord and the body. Nerves are categorized into three, primary groups based on the direction of signal transmission within the nervous system. Afferent nerves conduct signals from sensory neurons to the central nervous system, for example from mechanoreceptors in skin. Efferent nerves conduct signals away from the central nervous system to target muscles and glands. Mixed nerves contain both afferent and efferent axons, and thus conduct both incoming sensory information and outgoing muscle commands in the same nerve bundle. 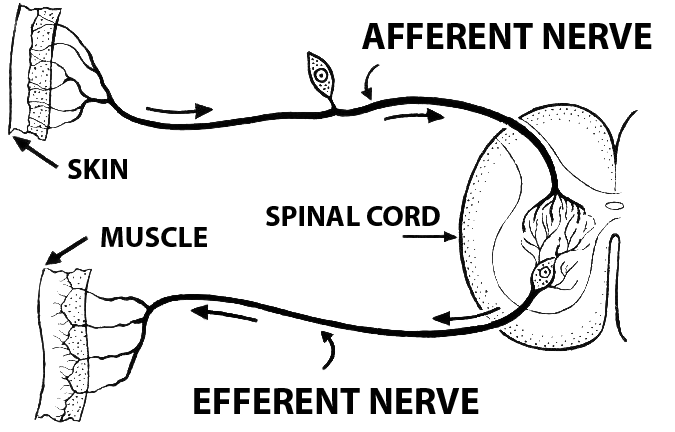 Afferent and efferent nerve transmission: Schematic of efferent and afferent nerve transmission to and from peripheral tissue and spinal cord. Nerves can be further categorized based on where they connect to the central nervous system. Spinal nerves innervate much of the body and connect through the spinal column to the spinal cord. Spinal nerves are assigned letter-number designations according to the vertebra where they connect to the spinal column. Cranial nerves innervate parts of the head and connect directly to the brain. Cranial nerves are typically assigned Roman numerals from 0 to 12. The A group is further subdivided into four types (A-alpha, A-beta, A-delta, and A-gamma fibers) based on the information carried by the fibers and the tissues they innervate. A-alpha fibers are the primary receptors of the muscle spindle and golgi tendon organ. A-beta fibers act as secondary receptors of the muscle spindle and contribute to cutaneous mechanoreceptors. A-delta fibers are free nerve endings that conduct painful stimuli related to pressure and temperature. A-gamma fibers are typically motor neurons that control the intrinsic activation of the muscle spindle. Fibers of the B group are myelinated with a small diameter and have a low conduction velocity. The primary role of B fibers is to transmit autonomic information. Fibers of the C group are unmyelinated, have a small diameter, and low conduction velocity. The lack of myelination in the C group is the primary cause of their slow conduction velocity. Saltatory conduction: Demonstrates the faster propagation of an action potential in myelinated neurons than that of unmyelinated neurons. C fiber axons are grouped together into what is known as Remak bundles. These occur when an unmyelinated Schwann cell bundles the axons close together by surrounding them. The Schwann cell keeps them from touching each other by squeezing its cytoplasm between the axons. C fibers are considered polymodal because they can often respond to combinations of thermal, mechanical, and chemical stimuli. A-delta and C fibers both contribute to the detection of diverse painful stimuli. Because of their higher conduction velocity, A-delta fibers are responsible for the sensation of a sharp, initial pain and respond to a weaker intensity of stimulus. These nerve fibers are associated with acute pain and therefore constitute the afferent portion of the reflex arc that results in pulling away from noxious stimuli. An example is the retraction or your hand from a hot stove. Slowly conducting, unmyelinated C fibers, by contrast, carry slow, longer-lasting pain sensations.